BigBasket, the hyperlocal grocery delivery company, has become the latest entrant to India's mushrooming unicorn club. It has reportedly raised $150 million (around Rs 1,000 crore) in a fresh funding round with a 140% jump in its valuation compared to its previous round last year. The round was led by existing investor Alibaba, while South Korea's Mirae Asset, and CDC Group, a development finance group linked to the UK government, also participated in it, The Business Standard reported, citing documents sourced from business intelligence platform Paper.vc. While Mirae Asset put in around $60 million, China's Alibaba invested around $50 million and CDC, which had earlier seen successful exits from online fashion platform Jabong, invested $40 million. The Bangalore-based start-up had raised $300 million in a round led by Jack Ma's conglomerate in February last year. The company also counts Helion Ventures Partners, Bessemer Venture Partners, and International Finance Corp among its investors. "Following this Series F investment led by Alibaba, our estimate of the post-money valuation of BigBasket is $2.28 billion. We also believe that the company is likely raise more money as part of this financing round," Vivek Duari, Paper.vc founder, told the daily. 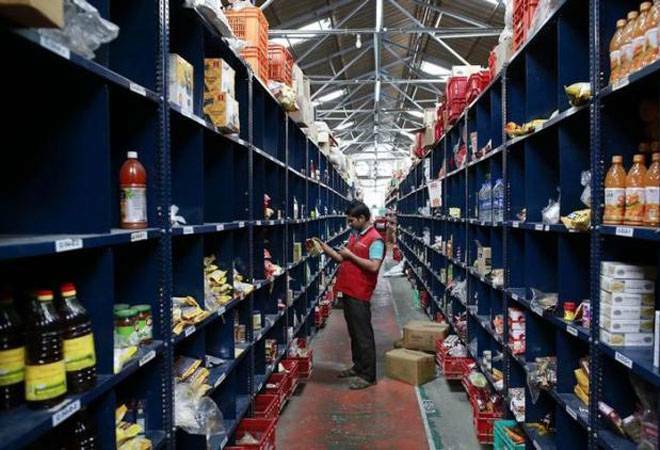 The fresh capital is expected to beef up BigBasket's war chest amid intensifying competition in the online grocery segment that is pegged to touch $2.7 billion in this fiscal. Earlier this month, Grofers announced closing $60 million from SoftBank, while marketplaces such as Amazon and Flipkart are also learnt to be doubling down on the grocery segment. The aggressive interest is understandable when you consider that food and grocery (F&G), which has been an underperformer among online retail segments so far, is expected to emerge as the fastest-growing segment over the next three years. As per CRISIL Research estimates, the segment will log a compound annual growth rate of 65-70% between fiscals 2018 and 2021. That's twice as fast as the 30-33% CAGR the overall e-retail industry is expected to log. Founded in December 2011 by Hari Menon, VS Sudhakar, Vipul Parekh, Abhinay Choudhari, and VS Ramesh, BigBasket has already positioned itself as the largest grocery delivery firm and now operates across 32 cities, with annual revenue of Rs 350-400 crore. Grofers reportedly trails with Rs 150-200 crore annualised revenue. In November, Menon told PTI that BigBasket aims to clock Rs 3,500 crore in sales FY19, up from Rs 2,000 crore last year, and expects to break even in the 10 large cities by June this year. Incidentally, BigBasket is the second company to enter the unicorn club in less than a week. Logistics startup Delhivery Pvt. Ltd joined it on Sunday after raising $413 million in its latest funding round led by Japanese investor SoftBank Vision Fund.